“Where’s the cat?” That’s my title for the above photo. We are officially moved! A week ago, our landlady called and asked us to move out 10 days early, giving us 6 days to move all our stuff and clean the apartment. It was the week when Madison was 90 degrees and 90% humidity everyday, the very hottest week of the year. Our schedule quickly became: haul heavy stuff in the morning, lunch, nap, haul lighter but still heavy stuff at night, collapse, rinse and repeat. Since we only moved a block, we didn’t do much pre-packing and we simply rented an open bed trailer, making small trips back and forth. I learned that even if you are just moving a block, it still means you have to pick-up every item you own. And man do we own a lot of stuff! Sunday night, apartment clean and keys turned in, it seemed unreal that we actually own and live in this house. It feels so very fancy after our ill-kept apartment with the bathroom from hell and a kitchen from purgatory. I’m so happy to be done with that place. Yay! Now to begin the unpacking. Our goal this time around: Throw stuff out (or sell it for cheap)! How can you not love color with descriptions like these? I’ll be sharing the final outcome of these wonderful color choices as each room is finished. On June 16th we became home owners in Madison. Owning a house in Madison has been a dream of mine, long before SB, before…I can’t even remember…since I knew what it meant to own a house. In college I would take walks late at night, looking at the cozy homes on the Isthmus and wonder what house would someday be mine. After I met SB, we spent many beautiful evenings fantasizing about our own future house. The journey of home ownership in Atlanta did not deter our dream of our one day Madison home. Now, next week, we will move into this house. A house that we now own but is not yet our home. For the past three weeks, with papers signed, we jumped into home improvement. The first day we picked out our first paint samples and began our new house PORP (project of ridiculous proportions). I’ve learned a ton and the house as our home has started to take shape. I can’t wait to know what our house will become. There could have been no better way to spend the fourth of July than seeing a dear friend marry her true love. The celebration encapsulated the essence of their love, their family and their friends. The rain held off, the mosquitoes blew away and they danced into the night. I wish them all the happiness of their wedding day to carry forward to everyday. I recently completed my ninth blanket, since taking up yarn crafting. 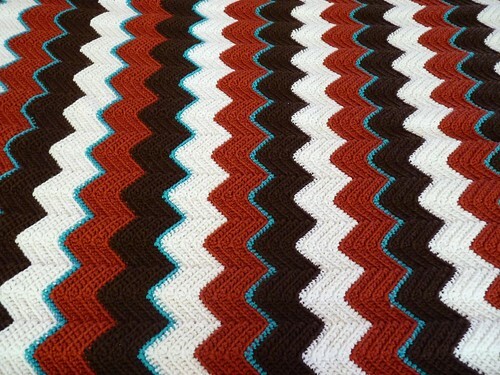 For this blanket, I returned to my classic crochet ripple, but this time it is a bigger blanket in bolder colors. The little turquoise lines add extra pop to the pattern and it is all done in super-wash merino wool, for machine washability. Looking back on previous blankets I can see how my skills are improving and my aesthetic is developing. The blanket is for the first child of the Crazy Rosie household and it needed to be vibrant just like their family.